Mounds of heavy snow fell on Monday night into all day Tuesday creating blizzard conditions. Howling winds blew our power out at midnight. In the morning, there was no freshly brewed coffee. Thankfully, I was able to light my gas stove to boil water for some instant Starbucks as I am unable to function without my daily shot in the arm. I also managed to make toast in a cast iron skillet. I was feeling very "pioneer woman" about it all until I got annoyed that the power outage lasted well into the day and the heat in our house plummeted to (gasp!) 54 degrees before civilized life and t.v. watching was restored at 4:30pm. As the snow swirled around looking for a place to settle, before we were able to go out and shovel a path and while the kids somehow managed to occupy themselves without the help of electronics (shocking!) I actually had the brief luxury of hiding in the office wrapped in my pink fleece robe and a woolly scarf while I cracked open and read a book that Val had passed along to me quite a while ago but I had not yet given myself the opportunity to lounge around and look at it. 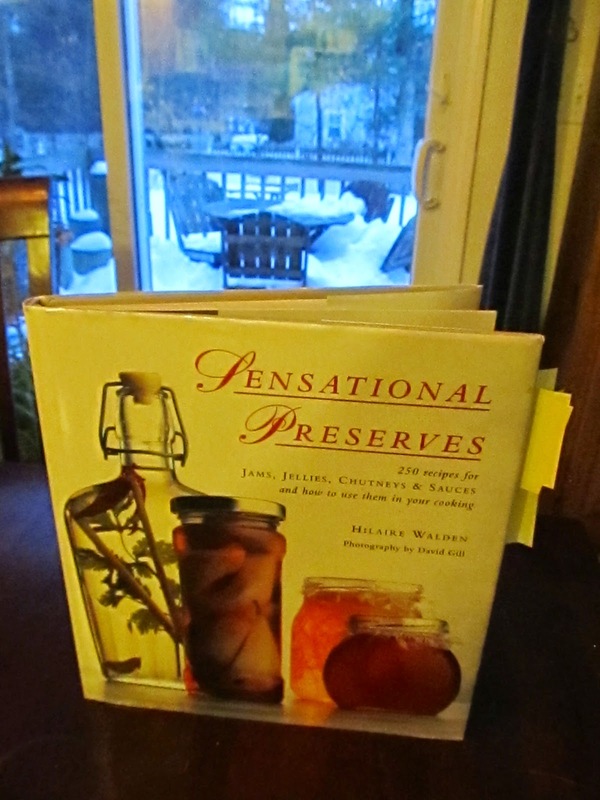 "Sensational Preserves" by Hilare Walden is fancy and at the same time accessible. There are some recipes that are a bit exotic to me but look easy enough to execute like "Mushroom Ketchup" and "Ginger Wine" that I can't wait to try.as well as tried and true favorites, basic recipes for fruit jams, jellies and chutneys. Most of the time, I only think about preserving in the summer months as Val has usually done. Beginning with strawberry jam in late June when Andrews Farm down the street, is bursting with deep red berries just begging to be put up and enjoyed on a cold winter day like this one and finishing off in August with piccalilli and pickled beets. But this year I've got bigger plans. I want to dry more tomatoes, pack them in a jar and cover them with fruity olive oil, mix spice rubs using plants from my garden (or Val's if mine are not successful!) and bottle up some barbecue or other types of sauces for my friends to unwrap at Christmas. I'm excited just thinking about it! Since I don't want to wait on this canning project, (I never want to wait for anything.) the chapter titled, "Citrus Fruits" is calling to me now while oranges, grapefruit, lemons and limes are in abundance at the supermarket. That is as long as the produce trucks can make it through all of this snow. 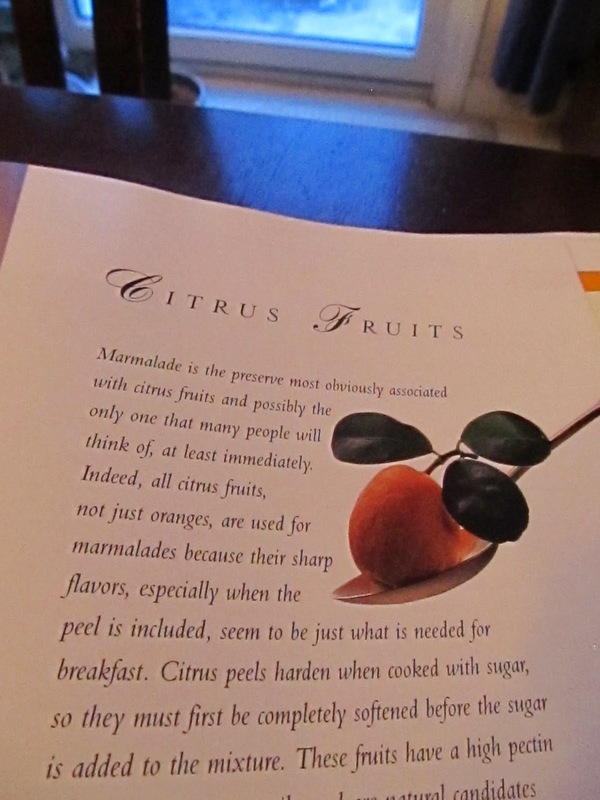 I'm not sure yet about "Preserved Lemons" although the recipe looks easy enough to give it a try, or the "Sweet and Sour Lime Pickle". I definitely have my eye on what Hilare refers to as "typically English fruit curds". I imagine slathering the sweet, buttery curd on warm toast or dolloping it into a crusty tarte shell, topping it all off with cold whipped cream. I think I'll begin with lemon since that is a favorite with most of my people, or perhaps tangerine? I'll have to decide as I peruse the aisles of the produce section of Stop n Shop and dream up my big citrus plans. I hope there is enough parking cleared for me at the store once I finally am able to dig my car out of the snow.